Club 36 staff members plan social and recreational activities that aim to address the cognitive, physical, social and nutritional needs of participants. All activities are purposeful and offer a sense of accomplishment for the people who attend. Club 36 is open from 9:30 a.m. to 3:30 p.m. Monday to Friday. 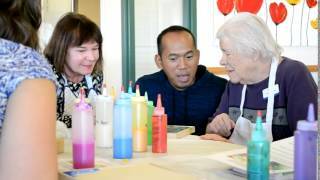 The Alzheimer Society of Calgary's Club 36 program operates in compliance with the Alberta Health & Wellness Continuing Care Health Service Standards.